I am one of those biologists who are always eager to get dirty, and to touch, smell, and feel nature from as close as possible. I graduated at Sofia University ‘Saint Kliment Ohridski’ as a geneticist and a mycologist, and now I am a PhD student at the National Museum of Natural History under the Bulgarian Academy of Sciences. My research interests lie in the area of molecular population genetics, cave microbiology, and chiropterology (the science that studies bats). Currently, I work on the White Nose Disease in hibernating bats that is caused by the cave fungus Pseudogymnoascus destructans or the white-nose fungus. I have been a passionate caver since high-school, and in 2017 I passed the ‘magical’ line of 1000 m underground. I have explored some of the biggest caves in several European countries, and I have given names to newly discovered passages in the volcanic tubes of Hawaii. I am also a diver, climber, and mountaineer, and I always enjoy pushing my limits — both physically and mentally. Additionally, I am a professional science communicator, author of popular science articles, and a classroom teacher, and I see teaching as a wonderful way of sharing my most powerful passions. The White Nose Disease (WND) is an infectious disease in hibernating bats caused by the fungus Pseudogymnoascus destructans — a sneaky parasite that not only colonizes naked bat skin, but successfully survives in cave substrates. A typical example of the so called pathogen pollution, the white-nose fungus is benevolent in Europe and Asia, where it originally evolved, but deadly in North America, where it was recently introduced, underlying the biggest die-off of mammals in modern history. As wildlife diseases are practically impossible to eradicate once they spread, what we can do is study them, and be ready to limit their impact or prevent similar cases in the future. As a part of the WND research community, I aim at: broadening the knowledge on P. destructans population dynamics, distribution mechanisms, and ecological requirements, thus contributing to long-term bat conservation; and popularizing caves as valuable microbial and animal habitats, unique natural labs, and purest source of inspiration by the ultimate unknown. Additionally, I am interested in the role humans play in transporting microbes from one underground system to another. 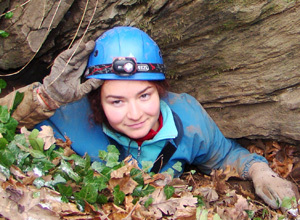 As a National Geographic explorer, I focus on extreme environments, and I work closely with Bulgarian cavers in order to collect samples from the deepest and most challenging caves in the country. Combining high-tech genetic analysis, classical microbiological methods, and sometimes crazy adventures in the field, I try to turn my research into a story, as although modern science in good enough in making conservation strategies more effective, it is only the personal, shaking, and intimate experiences with nature that answer the question why we need this.